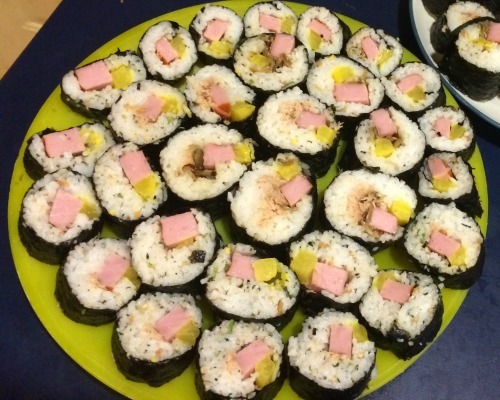 Ayusa student Ryoko shares some of the similarities and differences between the Japanese dish makizushi and Korean dish kimpab. I'm exchange student from Japan. I have a Korean roommate living with me and we have made a lot of special food since we came here. One day I was talking with my roommate if we could make some traditional food in America. So my roommate called her parents to send some Korean food to the U.S. In October, my roommate's parents sent Korean food to the house. There were ingredients for "kimpab," a Korean traditional dish which is kind of looks like a Japanese traditional food call "makizushi". Although the ingredients were kind of different from "makizushi," the process of making "kimpab" was similar to it. I felt really familiar while making "kimpab". We made a bunch of "kimpab" for the dinner; it took pretty long time for us to make them. My host parents really love them! They love kimpab so much that we saw none of the remaining on the next day.